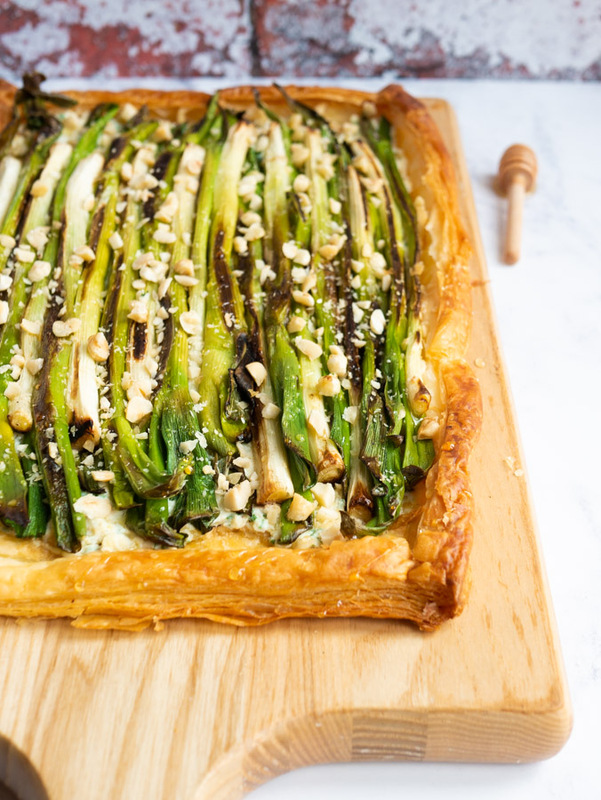 In this simple Spring recipe, a puff pastry tart base is covered with a mixture of ricotta, cheddar and chives. Then charred spring onions are added with a sprinkle of hazelnuts and a drizzle of honey. It’s essentially a cheese and onion tart, but with the volume turned way up! Spring onions. You’ve no doubt seen them sprinkled on top of stir fry’s, or accompanying hoisin duck pancakes. 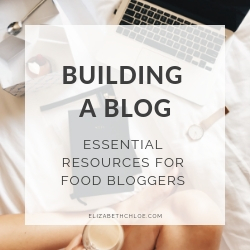 They’re often a small part of a recipe, but never really the main event. Always the bridesmaid but never the bride and all that. But not in this recipe. Nuh uh. I’m not a huge fan of raw spring onion, so when I first tried charred spring onions I was a little sceptical. But the change in flavour is crazy. Charring the spring onions produces a delicate onion flavour that brings out the natural sweetness of the onion, along with some added caramelisation. Alongside those flavours, we’ve got a mixture of creamy ricotta and sharp cheddar all layered on a crisp puff pastry tart base. To be honest this is essentially a cheese and onion tart. But a fancy one. And we like a little bit of fancy around here! 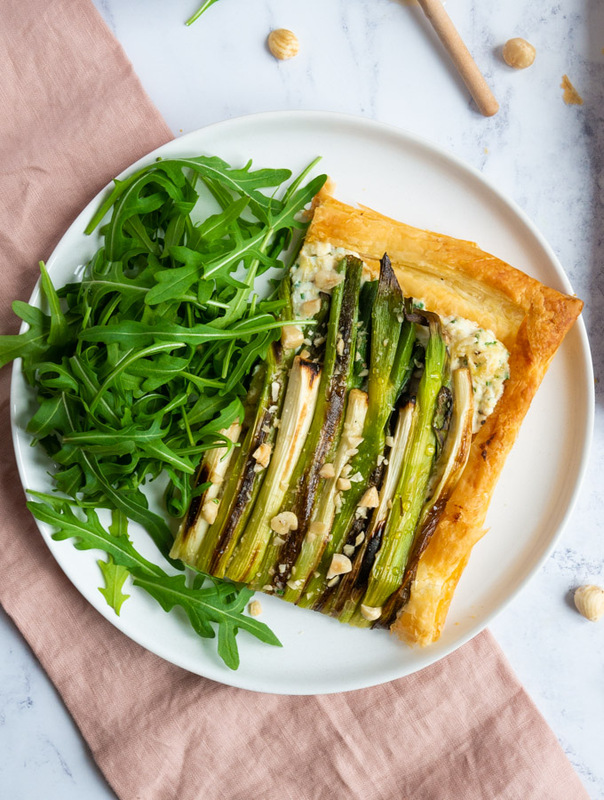 This tart is perfect for a vegetarian dinner or lunch, but you could cut the pastry down into smaller portions to make cheese and onion tartlets which would be perfect for appetisers or canapes. Mix the ricotta, cheddar, chives, lemon zest, salt and pepper together in a bowl then set aside. Heat 1 tablespoon of oil in a frying pan. 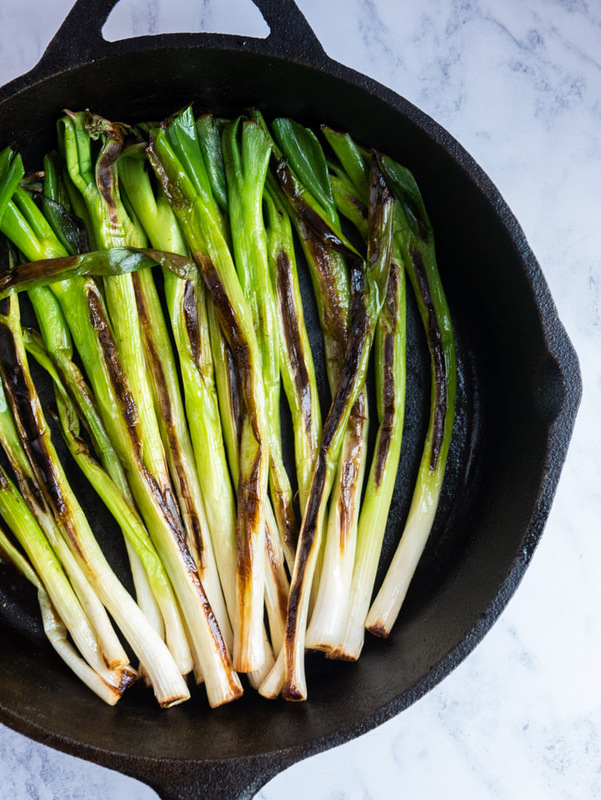 Cook the spring onions for 4-5 minutes, turning regularly, until they have charred and softened slightly. Remove the pastry from the fridge 10 minutes before you need to use it. Roll the pastry out onto a baking sheet. Using a knife score a line 1 centimetre away from the edge of the pastry. Prick the base of the pastry with a fork. Place the pastry into a pre-heated oven and cook for 20 minutes. Once baked, remove the pastry from the oven and use a wooden spoon or fish slice to press down the centre of the tart ready for the filling. Spoon the ricotta mixture onto the pastry base, using a knife to spread it evenly. Lay the spring onions vertically along the tart. Then top with chopped hazelnuts. Bake the tart for another 10-15 minutes until the ricotta mixture has warmed through and the crust is golden brown. Drizzle with honey before serving! Allow the tart to cool at room temperature for no more than two hours. Transfer to an air-tight Tupperware container and store in the fridge for 3-4 days. Transfer the tart to a baking tray and pop into a pre-heated oven for 10-15 minutes until warmed through. Cover the pastry crust with tin foil if it begins to burn. You could also reheat this tart in the microwave, however the pastry will lose its crisp. 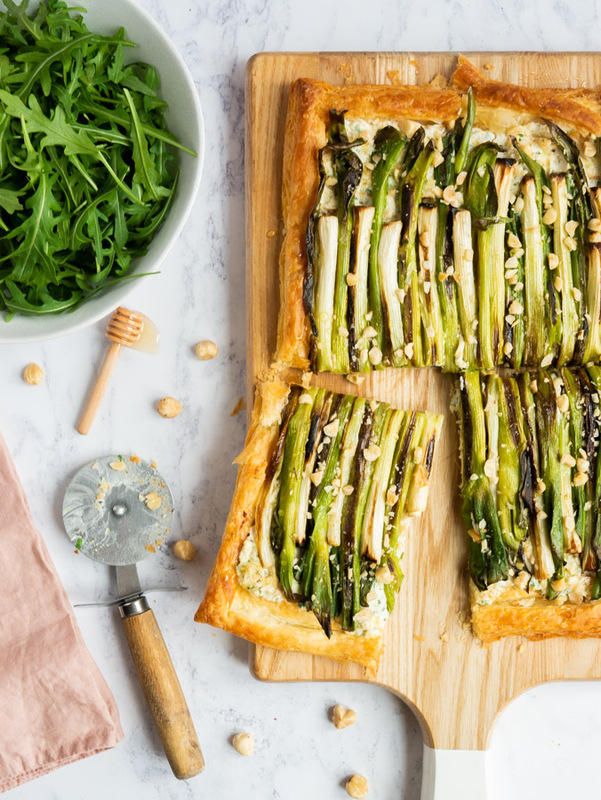 Serve this spring onion tart alongside a simple green salad. If you wanted to go a little further add in some boiled or steamed new potatoes with a little butter. 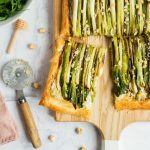 Puff pastry is covered with a mixture of ricotta, cheddar and chives, then charred spring onions are added with a sprinkle of hazelnuts and a drizzle of honey to make this simple Spring Puff Pastry Tart! 450 grams spring onions, ends and outer layers removed. Pre-heat the oven to 200 degrees centigrade. In a mixing bowl combine the ricotta, cheddar, chives, lemon zest, salt and pepper. Set aside. Heat 1 tablespoon of oil in a cast iron frying pan over medium heat. Lay the spring onions in a single layer in the pan and cook for 4-5 minutes, turning occasionally. The spring onions are done when they have developed a golden brown char on approximately 50% of their surface area and they have softened. Do this in batches if your frying pan isn’t big enough. Once done set aside. Remove the pastry from the fridge 10 minutes before you need to use it to ensure it is still cold. 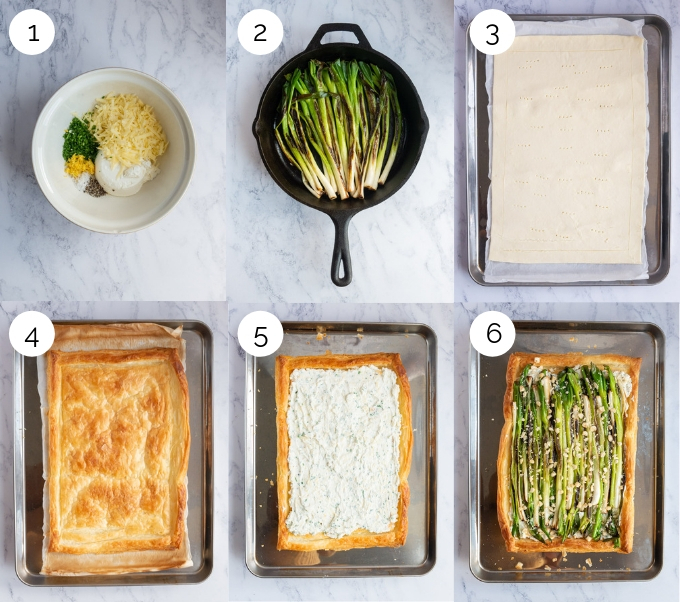 Lay the pastry out onto a baking tray. Score a line around the edge of the pastry, leaving a 1-centimetre gap. Prick the base of the pastry inside the scored line with a fork. Cover the pastry with a layer of baking paper to stop it getting too brown then place it into the oven and cook for 20 minutes. Remove the pastry from the oven and use a wooden spoon or fish slice to press down the centre of the tart ready for the filling. Spoon the ricotta mixture onto the pastry base, using a knife to spread it evenly. Lay the spring onions vertically along the tart. Then top with chopped hazelnuts. Bake the tart for another 10-15 minutes until the ricotta mixture has warmed through and the crust is golden brown. Drizzle with honey before serving! I like to prepare the ricotta filling and spring onions before getting started on the pastry. This is to keep the pastry cold and allows the filling to come to room temperature while I focus on cooking the pastry properly. If you are a little more organised you could start cooking the pastry base while preparing the fillings. What I lovely tart for spring! I love all these flavors! My husband loved it! A new favorite at my house! Wooo! I’m so glad Toni! These look delicious! 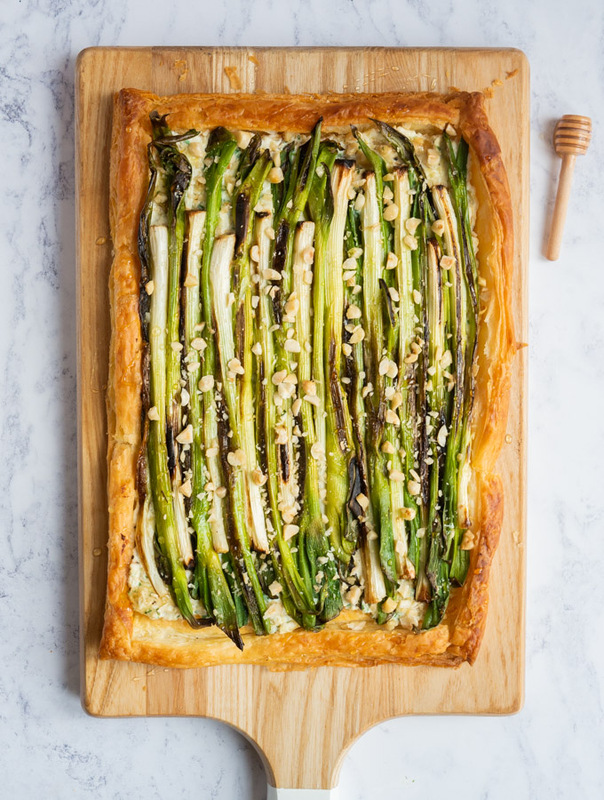 Absolutely beautiful tart – and I’ve never cooked with spring onions before! 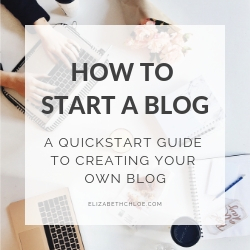 I’ll have to try! The flavors for this is unbeatable! I love ricotta cheese, everyone who tried it with me loved it as well! I would love to try this one out this Saturday for my family. Thanks for the detailed post, the tart looks delish. Thanks so much, Meghna! Let me know how it goes!